You can now get bran cereal flakes with both raisins and bananas right out of the box with the introduction of new Kellogg's Raisin Bran with Bananas. 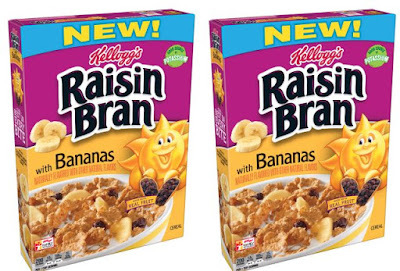 Apparently, the addition of bananas was a top-requested flavor for Kellogg's Raisin Bran so you can now get the cereal with banana slices. The new cereal is currently being rolled out to major retailers and grocery stores and can be found in 14.5-oz boxes for a suggested price of $3.99.